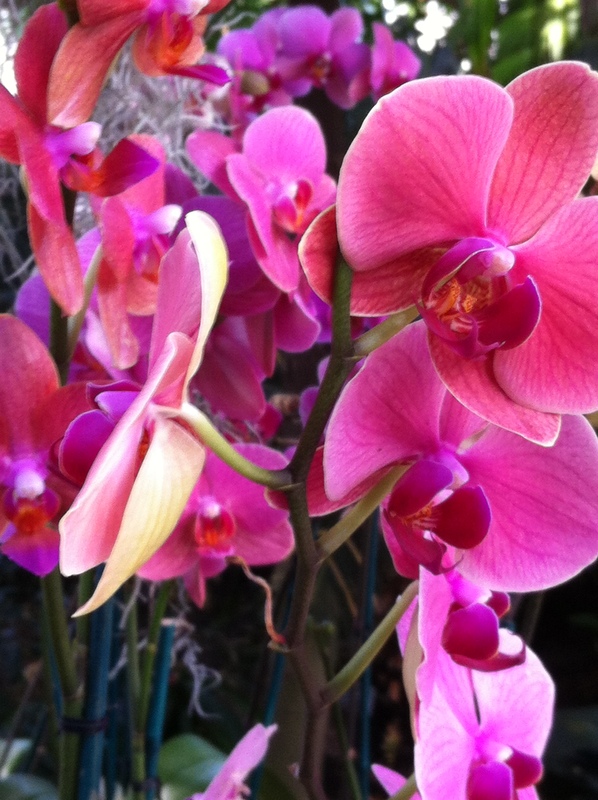 March 11, 2014 bcalvanocoachingLeave a Comment on Weekly Angel Oracle Card Reading for March 10 through 16. Weekly Angel Oracle Card Reading for March 10 through 16. 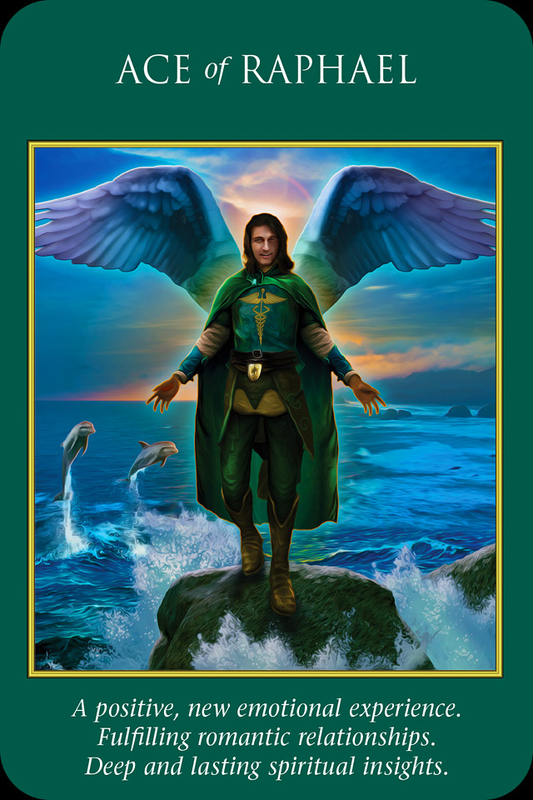 This week I am guided to use the Archangel Power Tarot Cards by Doreen Virtue and Radleigh Valentine. As spring approaches we experience the burst of energy and support from the angels and universe. 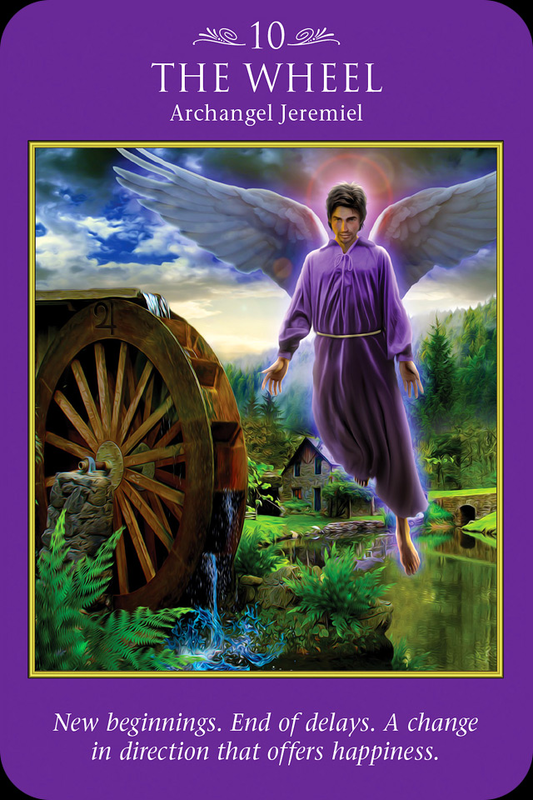 For Monday and Tuesday we have the card, The Wheel with Archangel Jeremiel: New beginnings. End of delays. A change in direction that offers happiness. A great start of the week where we are inspired to move forward with our flow of new energy, thoughts and ideas. The wheel indicates a positive turn of events and that the universe is supporting us as we take actions to move forward and allow grace to happen. Archangel Jeremiel can assist us with a clear vision of our dreams and to inspire us to successfully make changes. This is a week of sudden or unexpected moves allowing you to finally get into action in areas of your life where you would like more joy and fulfillment. If you have been having difficulty getting things moving or in letting go of the past, this message says be present to the support available for you to ‘let it roll.’ Be present to the ideas and changes you are experiencing and take action! For Wednesday and Thursday we have the card, Five of Michael: This situation doesn’t serve you! Release your attachments to the outcome. Consider taking a more uplifting approach. Here we follow up with the first message. You are clear about what you want to create and manifest and yet you are still confused, drained and stressed. First we let go our attachment to a specific outcome. Allow the angels to guide you towards a way that you could never even imagine! It’s time to purge and let go of those people and places that you know longer serve you. This can also be ideas and thoughts you have had about life that really are not empowering you. 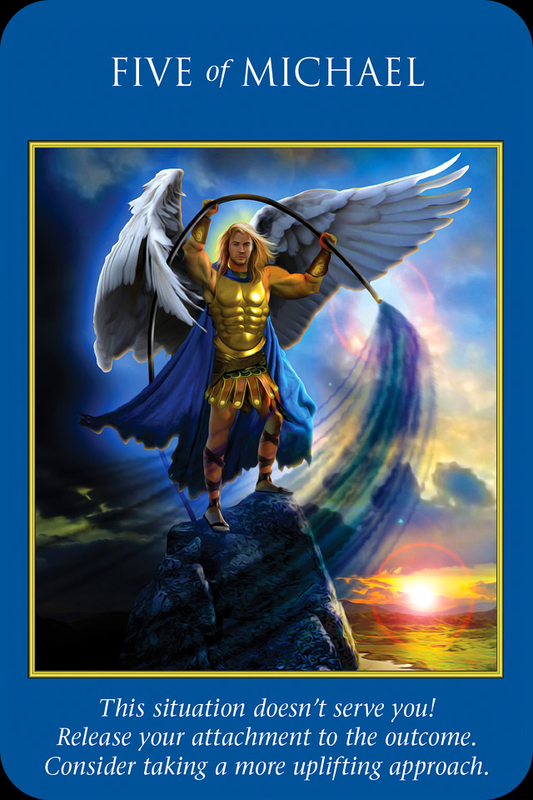 It’s time to allow Archangel Michael to clear aware your worries, concerns, doubts, fears- any lower energies that are not pure joy and bliss. Practice life affirming thoughts and actions to support your new ventures. It’s another week of spring cleaning to allow the new energy to flow! For Friday, Saturday and Sunday we have the card, Ace of Raphael :A positive new emotional experience. Fulfilling romantic relationships. Deep and lasting spiritual insights. Again this card has a message that blends beautifully with the first two. Archangel Raphael is supporting us with a new person or situation that enters our lives that brings us more fulfillment and happiness. With this is a powerful shift with our spiritual insights and intuition. Trust these new thoughts and feelings as they are the access to your joy. More often than not the only thing missing for people is their ability to trust themselves. The angels give us answers when we ask, great insights, ideas, messages and guidance and yet we doubt ourselves and do nothing more than complain and continue to be disempowered. This week we are being told to be aware the turning of the wheel of fortune in our life. There are experiences that can guide us more easily towards our joy and happiness. Grace and ease are available when we pay attention, let go of what no longer serves us and take positive actions to create our lives. Let go and let God this week! The light of love is everywhere! And so it is! Allow your angels to support you! All you have to do is ask…then listen, and take action without hesitation or delay! I have postponed my 2 clases in March until later this year. I will keep you posted! 10 am to 5pm doing 15 & 30 minute readings. Join me where there will be a variety of amazing holistic vendors, speakers and exhibiters all supporting our mind, body and spirit! I am available for indepth one hour personal readings, talks, angel parties, workshops and mini angel reading events! Today, March 11 marks the 3 year anniversary of the devastating tsunami in Japan. I remember upon hearing the news thinking, it has finally happened. As a young girl living in Japan I would often nervously look at Mount Fuji, a volcano, on my way to school and examine for any wisps of smoke perhaps indicating an eruption might occur. After a few moments I would relax, then skip along to school on the cherry blossom petaled sidewalks. We lived with tiny earthquakes that would rattle the plates in our kitchen cupboard almost on a weekly basis. I remember looking at Japanese art work,prints an paintings that would depict the big destructive tidal wave from the far past. When this tsunami occurred it felt like an old ghost finally returned as had been depicted predicted in this old art. I wasn’t totally suprised. And yet I was numb with disbelief. Three years ago my cousin and his son were visiting the US for the first time. It had been the first time any of my Japanese family had visited the US after 47 years when my Mother first left Japan. My Japanese mother had gotten pregnant with me and married an American soldier in 1954. Despite this beautiful moment, it was not a time of forgiveness and peace with my families and on both sides. We had a beautiful visit 3 years ago in Ohio and New York. On the day they were to return to Japan the earth quake and tsunami occurred. I remember being at JKFK airtrain platform and observing my cousin and his son look out through the windows into the distance. I remember how they looked sitting in the subway as we traveled to JFK. The joy and exhilaration of visiting the US were replaced by a sense of void. That somber day they returned to Narita airport on the last flight out of JFK . They began theire long drive back home up North. No one in my Japanese family suffered. Three years later in 2014 they returned with two more family members to celebrate his retirement and a college graduation. They enjoyed a celebratory vacation in NYC and LA. Today on March 11, they again travel back to Japan. I honor and respect his courage and strength to celebrate life. To share his joy and peace with me and my family here in the US. In life tragedies will happen. Families will separate. Hurt will happen. Stories will be retold decades after decades about what had happened to create the sadness and separation. Have the courage to today reconnect, rebuild, retravel, regrow, return to your humanity completely, your family no matter what the pain and suffering. As a human being we have the capacity to love more deeply than we could ever imagine. We have the capacity to forgive more powerfully than we could ever imagine. The work that I do today working as a Life coach and Spiritual Intuitive is all about this. It is about accessing this enormous unlimited capacity of life force each of us has at any given moment. Allow the light to enter your heart. Today be free from any source of pain and suffering. Live your life with grace and ease. And so it is. Next Today’ show 3/15 rescheduled to Monday March 17 4pm EST!